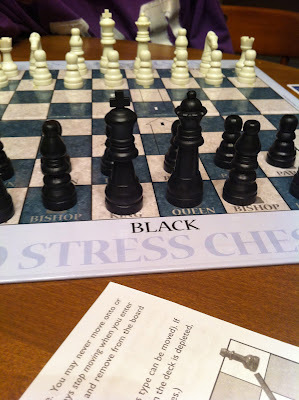 Chess - With No Stress! I do not know how to play chess. When I read in The Story of The World Activity Guide that Chess is the perfect addition to our Medieval studies, I knew I had to get over my fear. I wasn't aware of the origins of chess, so I found a little bit of reading to enlighten all of us. and want you to know about it, too. Chess School is in session. Everyone pay attention and take notes! I love my husband so much. 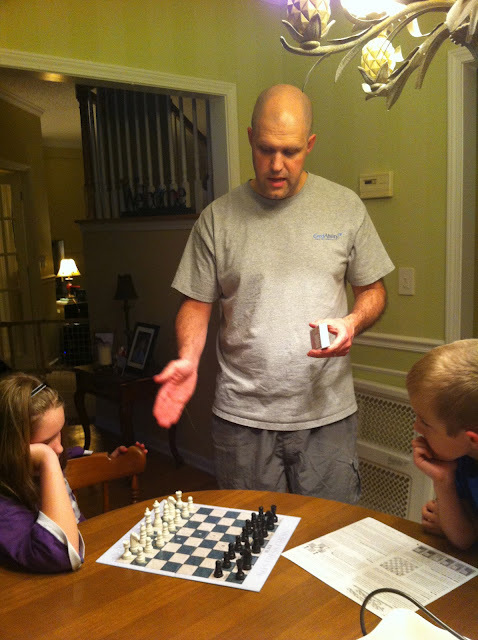 He takes his job as a dad seriously - he has enjoyed homeschooling lately! He told the kids all about how he played Chess with his dad when he was a little boy (that Chess board is at Granddaddy's house still - I bet next time we are there the kids will play a game! ), and how the pieces they used came from Europe when Granddaddy was in the Air Force. I love how homeschooling allows us to share pieces of family history while we learn about the more broad history of our world -- making these personal connections is why I love this lifestyle. 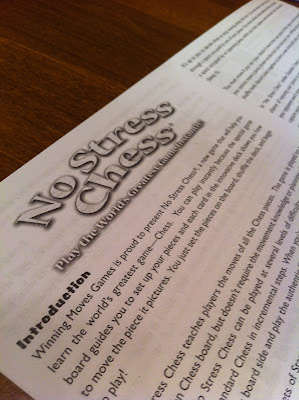 No Stress Chess is a Chess Training Game (at first) and then a full blown Chess game. One side of the board helps the children with where they can move their pieces. 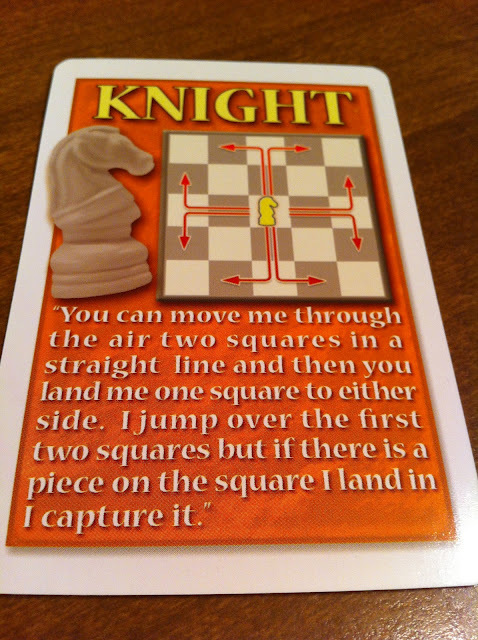 It also uses game cards that you draw to help you learn how to move the pieces. The directions are very clear. I think after several times of playing, then they will be able to flip the board and play without hints or training cards. 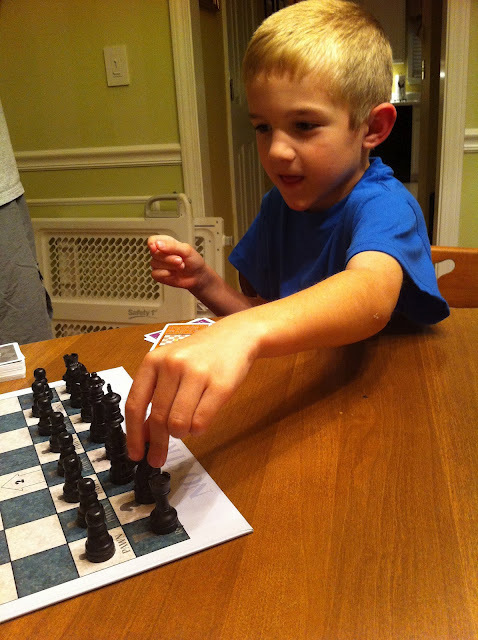 Learning to play Chess has been a great time for the kids to learn from dad, and a great way for them to be quiet and thoughtful. Can you see the joy in his face? This is what "school" is all about!